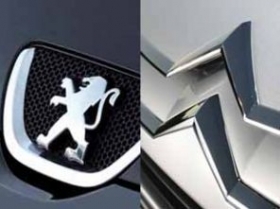 PARIS (Bloomberg) -- French government interference helped PSA/Peugeot-Citroen and Renault get through the financial crisis in 2009, but it now risks pushing the two companies further behind rivals including Volkswagen as job-security pledges prevent the companies from shedding overcapacity. Last month, union representatives from a PSA factory hoped to meet with President Nicolas Sarkozy's campaign in the run-up to the first round of elections. Then Sarkozy himself appeared. "That was a surprise," said Tania Sussest, a representative for SIA, the biggest union at the factory, which is about 20 km northeast of Paris. "We thought we would talk with the spokeswoman." The French president, who faces a close runoff against Socialist challenger Francois Hollande on May 6, listened carefully for about 45 minutes and then pledged to meet PSA CEO Philippe Varin to support the union's call to secure jobs. He fulfilled that promise two days later, summoning the CEO to the Elysee Palace, Sarkozy's official residence. Both Sarkozy and Hollande are keen to ensure that jobs remain in France, with the nation's jobless rate stuck at a 12-year high. The automobile industry directly employs about 233,500 people, according to the French statistics office. Indirectly, about 9 percent of France's workforce is linked to autos, according to the country's carmakers' association. "There's no big difference between the two candidates on this issue," said Carlos da Silva, an analyst at IHS Automotive. "A lot has already been done during the financial crisis to support the automobile sector. Now, given the general outlook in Europe, today's urgencies are: shore up public finances, shore up public finances, shore up public finances." That mantra isn't helping to sell cars. PSA's market share in the 27 EU countries plus Switzerland, Norway and Iceland fell 11.9 percent in the first quarter from 13.3 percent, while the Renault Group, which includes Dacia, dropped to 8.2 percent from 9.9 percent, according to data from the industry association ACEA. European market leader VW generated more than double the combined revenues of PSA and Renault in the first quarter. PSA stock is currently the only decliner among European automakers this year. PSA shares have dropped 14 percent this year, compared with a 24 percent gain for VW. Renault shares have gained 28 percent, with the company's exposure to Europe lessened by its alliance with Japanese carmaker Nissan. The PSA plant in Aulnay, which makes the 12,800-euro ($16,965) Citroen C3 subcompact and employs about 3,300 workers, may be a test case for the ability of French carmakers to overcome political opposition to restructure. Varin said last year that the factory has a "competitiveness problem," calling into question its future beyond 2014. Hollande isn't allowing Sarkozy to appear to be the sole protector of French jobs, which is a major political issue with 2.9 million people out of work. The Socialist candidate moved to thwart efforts to cut jobs after the election. "I won't allow a parade of firings that have been postponed," he said on France 2 television on April 25. "There needs to be a sense of responsibility in executive suites at companies. The day after the election, before irrevocable decisions are taken, I will have to intervene." The activist approach of the French government puts auto executives in a bind as they look to earn money needed to make investments in research to fulfill regulatory demands to make cleaner-running vehicles. "Different countries are not encouraging at all the restructuring of the industry," Renault CEO Carlos Ghosn said at an automotive forum in New York in early April. "As long as you cannot restructure, you may survive, but you are weakening all the time." PSA can't afford that. Net debt last year more than doubled to reach 3.4 billion euros at the end of 2011. To boost finances, the automaker pledged to cut debt "significantly" this year after posting a 7.3 percent drop in sales in the first quarter to 14.3 billion euros. Money-raising efforts in 2012 included the sale of its 48-year-old headquarters building and the issue of 1 billion euros in shares at a 42 percent discount. PSA also agreed to a partnership with General Motors Co. aimed at reducing purchasing costs and development spending in an effort to revitalize European operations. As part of the deal, GM bought 7 percent of the French carmaker. None of those efforts will do much to overcome PSA's overcapacity problem. The manufacturer said its European capacity utilization rate dropped to 83 percent in the first quarter. Its full-year capacity utilization rate will be about 75 percent, according to IHS Automotive estimates. "The situation will continue to be as bad for Peugeot" after the elections, said Kristina Church, an analyst at Barclays in London. "It can't go on like this. Whatever the government, the question will be: Do you prefer a company that survives or one that continues losing money?" Renault is also battling overcapacity, with a European factory utilization rate of 75 percent for 2012, according to IHS Automotive estimates. The company is more directly tied to the government through the state's 15 percent holding. As part of the government's activist approach, Ghosn had to pledge to make building upscale vehicles in French factories a priority to get approval for appointing a new chief operating officer. "Today's problem is about overcapacity," union representative Sussest said. "It has nothing to do with right-wing or left-wing politics."